Simply fly over to Schelly's Hair Salon to buy this absolutely adorable 'do. According to Sweet Pea in the Pixie Central news, they're "A permanent addition to her salon!" Start off the new year with a bold new look in Schelly’s Hair Salon! In honor of Art Month and endless creativity, Schelly is releasing a permanent addition to her salon – hair highlights! Fly to the salon in Palm Tree Cove now to start experimenting with the many possible color combinations. Show off your creativity with blonde, red, or even electric-hued highlights (like mine)! 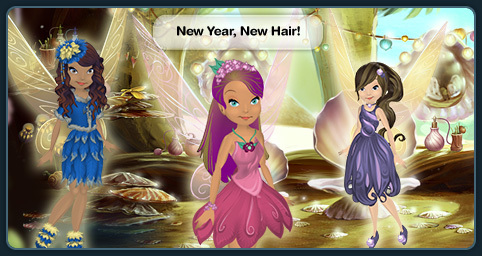 Because both hair highlights and the new January shop collections come out today, Marina will be flying in on Thursday to pick out Fairies for her January Fashion Spotlight. That gives you a couple days to perfect your outfits for your chance of being featured here on the Never News! What do you think of this bold, new look?